The V20 held a series of meetings in conjunction with delegates of the Climate Vulnerable Forum meetings on Monday 27 and Tuesday 28 August 2018 in Addis Ababa, Ethiopia. The meetings included the V20 Focus Group Meetings III, an inception discussion on the V20 Joint Technical Committee Meeting on Multi-Country Financing Initiatives, a joint CVF-V20 Troika Meeting, and a High Level CVF-V20 Presidency Handover Reception. The event saw the participation of V20 Delegates, CVF Delegates, Technical Partners and expert invitees. The presidency handover marked the conclusion of Ethiopia’s two-year presidency of the CVF and V20 and its handover to the Marshall Islands, now new CVF and V20 Chair. Read the press release regarding the handover of chairmanship from Ethiopia to the Marshall Islands. The meetings focused on reporting from the V20 Chair on progress on 2017-2018, the V20 Work Plan inclusive of the InsuResilience Global Partnership (IGP) and green finance. The meeting also discussed reporting from the CVF Chair on 2017-2018 activities. The climate vulnerable forum (CVF), now uniting 49 of the world’s countries most vulnerable to climate change, has again taken centre-stage in the fight against global warming and for an equitable international climate regime. 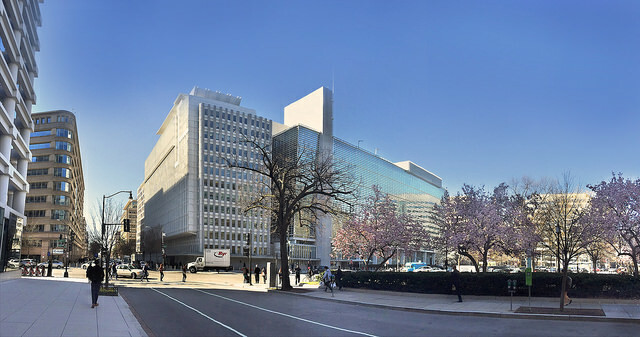 At the recent IMF and World Bank spring meeting in Washington, the finance ministers of the group, the Vulnerable 20 (V20), met with representatives of its “big brother”, the G20, to discuss issues related to climate finance, effective mitigation policies, support for adaptation and resilience and above all: enhanced cooperation. After their vital role in negotiating the landmark Paris climate agreement, and anchoring the 1.5 degree temperature goal the group has repeatedly positioned itself as a global leader in innovation and ambition – despite their limited economic prowess. In their Marrakesh Communique launched 2016 during COP22, the CVF pledged to transition to 100% renewable energy provision as soon as possible, and by mid-century at the latest. A report commissioned by the CVF and UNDP underscores that the quest to stay below 1.5°C global warming represents an opportunity to leap-frog into better, healthier, more stable and independent renewable economies. During the meeting, speakers from Marshall Islands, Ethiopia, Costa Rica, and Barbados urged G20 countries to deliver their long-term low-emissions development strategies before 2020, and join the V20 in leading towards universal coverage of emission through carbon pricing by 2025. A particular emphasis was put on the need to end fossil fuel subsidies. The V20 recognized the need to be rigorously checked whether fossil fuel consumption subsidies provide an actual benefit to the poor, and subsequently design their replacement worldwide without harm to those relying on them for their basic energy needs. However, the group is much stricter when calling for the end of market distorting fossil fuel production subsidies. The latter should be removed immediately and no later than 2020, and the G20 should adopt a clear timeframe for fossil fuel subsidy elimination – which the G20 fails to deliver since 2009. However the V20 did not only appeal to the major emitters. In keeping with their frontrunner-tradition, the V20 announced it would pioneer innovation in climate finance to help secure continued economic development among its members while tackling the costly economic impacts of climate change. They decided to establish a Task Force of independent experts to assess the financial requirements for climate action consistent with the Paris Agreement, with a view of delivering maximal resilience and a low carbon development consistent with 1.5 degrees Celsius. They also resolved to establish a technical committee to develop multi-country financing initiatives towards the advancement the V20 Action Plan and its aim of attaining a significant increase in climate investment in V20 countries. While the G20 finance ministers remained strangely silent on the matter, the V20 welcomed the recommendations from the Financial Stability Board Task Force on Climate-related Financial Disclosures, highlighting that the compatibility with the 1.5 degrees limit should be integral part of what these disclosures should assess. V20 pledged its collaboration in the effective implementation of those recommendations, and in further study of the development policy implications of green finance and risk instruments. While reiterating the criticality of the $100 billion commitment and the need to significantly upscale concessional financial means via Multilateral Development Banks for achieving transformational change in line with the Paris Agreement the V20 also stressed the need to increase prioritization of adaptation finance to ensure a 50:50 balance of finance for adaptation and mitigation by 2020, calling for continued scaling up of financial support in a balanced manner. Excellencies, Partners, Colleagues, Ladies and Gentlemen, good afternoon! Last year was a landmark year for our planet and people. Four documents were adopted internationally, identifying plans of action and setting commitments to address complex issues on development. The Addis Ababa Action Agenda Document under the Financing for Development and the 2030 Sustainable Development Agenda set targets and courses for action to achieve sustainable development over a 15-year period. The Sendai Framework 2015-2030 renewed our efforts on disaster risk reduction and resiliency. And before the year has ended, the world witnessed the historic adoption of the Paris Agreement under the United Nations Framework Convention on Climate Change (UNFCCC). Thus, the launch of the Vulnerable 20 last year could not have happened under a better backdrop. Our membership represents the world’s most urgent rationale for action, with some facing down the threat of extinction with rising global temperatures. Be that as it may, last year’s developments gave us our best hope yet, that we could still unite and work towards climate change mitigation and adaptation. Today, we meet again to manifest our commitment and pick up the pace of the progress we made on the advocacies we first set during the V20 launch in Lima last October 2015. The commitments we have made during our first Ministerial meeting in Lima and the goals we pushed for in Paris – the temperature goal, the financial goal, and other non-financial commitments – were all borne out of dire existential threats the lives and livelihoods of our people face. Indeed, the very creation of this grouping was such that vulnerable, developing nations—often at the margins, and who far too often go unheard—can band together to voice a clear demand and vision for global climate action, with financing as an integral part of the solution. While the adoption of the climate agreement in Paris was by all accounts historic, we recognize that this is merely a modest beginning towards securing a sustainable future for our world. The climate agreement retained the less than 2 degrees Celsius target for top emitters while recognizing the importance of working towards a global temperature below 1.5 degrees Celsius. Let us be unequivocal about this: we need to achieve and undertake more ambitious targets, especially for top emitters. We will continue to advocate for a below-1.5 degrees Celsius target, as agreed in Lima last year. This is a matter of survival; settling for less ambitious goals means some of us, our people and our lands, would be wiped off the face of the earth by the ravaging effects of global warming. If we do not push for stronger measures to arrest dangers, the estimated US$45 billion annual loss of GDP potential since 2010 is expected to increase to close to US$400 billion in the next 20 years, which means an annual loss of at least 2.5% of our GDP potential per year will be escalated. We would experience a sea level rise that will partially or completely submerge the island nations of Kiribati, Maldives, and Tuvalu, displacing at least 500,000 people. The inundation of approximately 17 percent of land areas and the displacement of about 18 million people by 2050 in the case of Bangladesh will be made more likely. We know that significant levels of finance, including US$90 trillion in infrastructure investments by 2030, are a requirement. Current estimates argue for more investments for climate action. In a 2014 joint report of the UN Office for the Coordination of Humanitarian Affairs and DARA, the ever increasing funding requirement to finance climate actions have led to a “global deficit in the operational and financial capacities” of governments and non-government humanitarian organizations, to respond to climate-induced problems, especially in the vulnerable countries. Thus in Lima, we agreed to scale-up and accelerate the rapid mobilization of climate finance. We acknowledged the internationally recognized commitments on climate finance, in particular the US$100 billion per year from 2020 joint mobilization target of developed countries to support developing countries in responding to climate change. The Paris Agreement has also stressed the goal of US$100 billion per year by 2025 and as a floor thereafter. Our members appreciate the considerable progress achieved as developed nations strive to deliver on the joint 2020 mobilization commitment of US$100 billion per year for global climate action. According to a recent OECD report in 2014 however, mobilization levels were still US$38 billion short of this figure, underscoring just how much remains to be accomplished in the next 5 years. The V20 Group is convinced closing the outstanding gap to US$100 billion is not only achievable, but that it may even be surpassed prior to 2020 in order to secure fast-tracked climate protection and benefits for all—if we keep up the healthy amount of pressure for progress for the sake of the most vulnerable of our populations. We are encouraged that developed countries have scaled up financial and non-financial resources through announced commitments and pledges of contributions. We will count on developed countries to fulfill their commitments towards providing “public and grant-based resources for adaptation” and achieving the balanced funding for adaptation and mitigation, focusing on “particularly vulnerable” countries with significant capacity constraints from the Least Developed Countries and Small Island Developing States. The formulation of a clear, concrete road map for support is crucial in the delivery of these commitments. We need more clarity on how the US$100 billion will exactly be mobilized. The V20 has set in place an ambitious goal of mobilizing US$20 billion per year by 2020 to address country determined priorities to support the implementation of INDCs [Intended Nationally Determined Contributions]  as well as plans consistent with low emissions and climate-resilient development. We continue to call on partners and financial mechanisms to achieve simplified and efficient application and approval procedures of accessing climate finance, and through continued readiness support to developing country Parties, including the least developed countries and small island developing States, both for the period before and after 2025. As the fight for our survival and future continues, we welcome into our V20 Group our new 23 member countries (member countries of our sister initiative, the Climate Vulnerable Forum, inducted in December 2015). Our growing number strengthens collective advocacy by assembling more voices and more hands towards global climate financing solutions. Our growing membership should not dilute our focus nor keep us from serving the core needs of our most vulnerable members. As we look towards COP22 in Morocco, our shared view in setting strong and innovative policies should translate to more accessible policy, financial, and technical resources. Our Group will be relentless in continuing to pursue transformative solutions for our shared climate-resilient future. I hope today will turn out to be a productive Ministerial meeting. May we have a meaningful discussion and work to agree on the targeted outputs and deliverables this afternoon. I look forward to building on our progress today. As contained in COP 21 decision text 1/CP.21 and Article 4 of the Paris Agreement. V20 delegates will meet at Washington DC on 29-30 March for the first time since the foundation of the V20 Group in October last year. 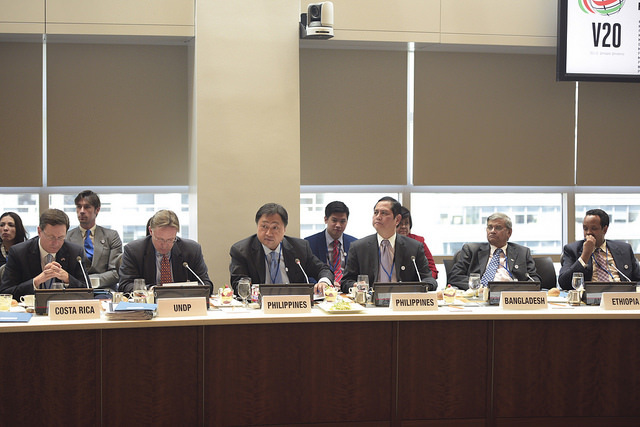 This 2nd meeting of the V20 Working Group, hosted by the Department of Finance of the Philippines, aims to prepare and advance the full range of the V20’s work ahead of the 2nd V20 Ministerial Dialogue on 14 April 2016. Items for discussion include the V20 Action Plan and plans for the creation of a V20 Risk Pooling Mechanism. V20 delegates will also engage in a structured dialogue with key V20 stakeholders, including representatives of multi-lateral institutions, think tanks, the G20 Green Finance Study Group and leading private sector actors.